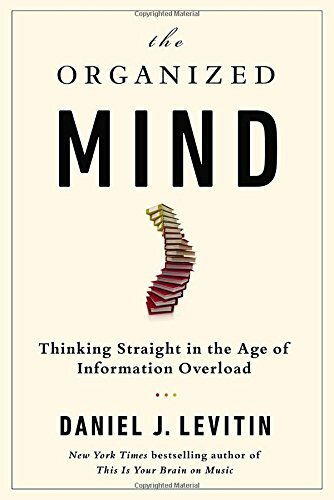 Daniel Levitin wears many hats: rock band member, neuroscientist, business management consultant, and above all, educator. And educate readers he does in his hefty (nearly 500 pages) yet always entertaining volume that addresses the modern problem of having too much to deal with—“the mess we are in,” as Levitin bluntly puts it. He draws heavily on evolution to explain why it is, for example, that our tendency to be attracted to anything new is maddeningly maladaptive in modern life. Every Tweet, text, Facebook update, and push notification hogs the limited bandwidth for attention that we have, and so robs us of time and attention to pay attention to the matters that matter. Levitin shows how common sense, which itself is rapidly dwindling in modern life, is often flat-out wrong and refuted by empirical evidence. He speaks to how one can judge the quality of opinions on the Web where each voice typically seeks to claim itself authoritative. He speaks to how we can know our minds better so that we can make decisions that better align with our true values. In short, he argues for having a mind that is quiet and can stay focused despite the deluge of distractions that hit us daily. Only such an organized mind can be still enough to generate creative ideas, he argues, and, even more, bring such ideas to fruition. Sadly today we find ourselves unable to pay attention to any one thing for very long. We rapidly switch between attention and a given task at a pace that is too rapid for our brains to handle. The result is mental and emotional fatigue. Moments of creative insight come when the mind is wandering––when it is not “on-task” thanks to what neuroscientists call the “central executive” in the brain’s frontal lobes. When mind wandering, however, the answer to a problem that has been occupying us suddenly appears from “out of nowhere.” But the place from whence it comes is the mind in its mind-wandering mode, making connections between things we hadn’t previously seen as connected in any way. Hence the solution pops up. Showing that our memory and attention both have limited capacity, Levitan explains why our minds are wholly unsuited to remembering the hundred passwords that life on the Internet now requires. His advice is to offload responsibilities and think seriously about categorization, whether the objects or documents that currently own us are physical or digital. And as for the uncategorizable stuff in our lives, well, it should have a space of its own––the famous kitchen junk drawer.